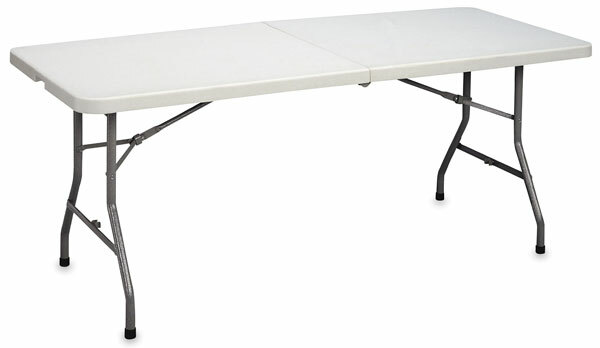 The Correll Fold-In-Half Table is a lightweight, economical folding table designed for easy handling, storage, and transportation. 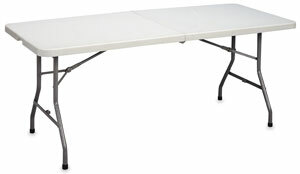 Measuring 72" × 30" when open, it folds down to just 36" × 30" and easily fit in most car trunks. This table features a waterproof, stain-resistant, and chemical-resistant molded plastic top in Gray Granite. The color is integrated with the surface material, so it can't wear off or be scratched away. The sturdy steel frame has a Charcoal finish.